Recombinant fragment, corresponding to a region within amino acids 270-492 of Human DNAJC3 (UniProt Q13217). 293T, A431, H1299, HeLa, HepG2, MOLT4 and Raji cell lysates. Our Abpromise guarantee covers the use of ab154714 in the following tested applications. Involved in the unfolded protein response (UPR) during ER stress. Co-chaperone of HSPA8/HSC70, it stimulates its ATPase activity. May inhibit both the autophosphorylation of EIF2AK2/PKR and the ability of EIF2AK2 to catalyze phosphorylation of the EIF2A. May inhibit EIF2AK3/PERK activity. Widely expressed with high level in the pancreas and testis. 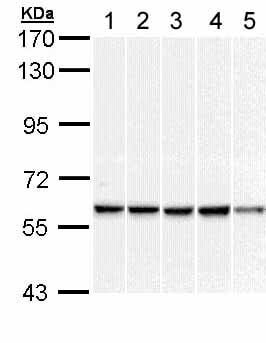 Also expressed in cell lines with different levels. The J domain mediates interaction with HSPA8. ab154714 has not yet been referenced specifically in any publications. Publishing research using ab154714? Please let us know so that we can cite the reference in this datasheet. There are currently no Customer reviews or Questions for ab154714.